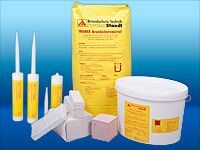 Solid fire stop consisting of fire protection mortar TROMEX or fire protection putty type FTS-K, for separating electrical cables of all types and cables for telecommunications including light wave cables. S90 universal use cable fire stop. TROMEX fire protection mortar is stirred without adding any additives except for water. For equipping the reserve space with post-installation wedges NIK (alternatively fire protection cushions). S90 cable fire stop for use in areas with high cleanliness requirements. The fire protection putty is supplied in a mouldable consistency ready to use. Equipping the reserves spaces with post-installation wedges UK (Alternative fire cushions). S90 separation of empty and reserve openings that are not yet occupied by cables, cuboid shaped solid form. Simple handling, laying without mortar or putty. Putty cartridges preferably to separate individual cable recesses, for post-installation or difficult to access areas. Combination of fire protection mortar and fire protection cushions or combination of fire protection putty and fire protection cushions. S90 separation with Staudt fire protection putty and arrangement of post-installation wedges if necessary.